Pause to consider the following . This tablet is a good 20 - 30 km from Redfort - then synonymous with Delhi. No one knows how many were on each side. Lake 'defeated' the Mahrattas led by a Frenchman called Monsieur Louis Bourquien. And on the strength of this victory they laid a claim to the Mughal stronghold at Delhi and the Scindia control of Meerut. Those not historians will never understand. ( Actually the Mahrattas were sub-contracted the defense of Delhi (custodians) and actually collected the revenue from Meerut and its environs). The British took proper control of Delhi only after 1857. Their control of Red fort was relinquished only in the year 2002(?) when the Indian army reluctantly gave it back to India. There is such little information available that a thought does cross one's mind - was this fictitious? There is no mention of the reason for battle. The obvious one was that the EIC was eager to lay their hands on the booty called revenue which was due to those in 'control'. A very cursory mention is given in the Gazette. Click here to get a flavour of the times. At least one more point is worth mentioning, the guns were muzzle loaders which in real terms meant that you really could only fire one shot in battle they took more time to reload than putting in a new arrow. So a video of the battle would be a very interesting thing :). This pillar is actually a Kiln . It is called Gol Bhatta ( round furnace ). It is called Hoffman's Kiln in an old map of the Cantonment . 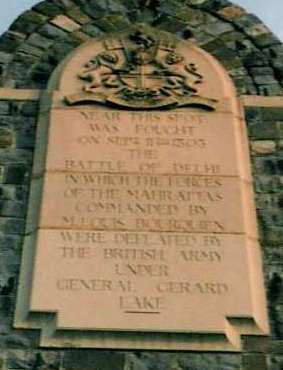 The Bricks which made the Cantonment came from here. ( What is a Cantonment ? How did they appear in India? For that Click here for a very well investigated write-up ) British occupation came to this region in 1803 . 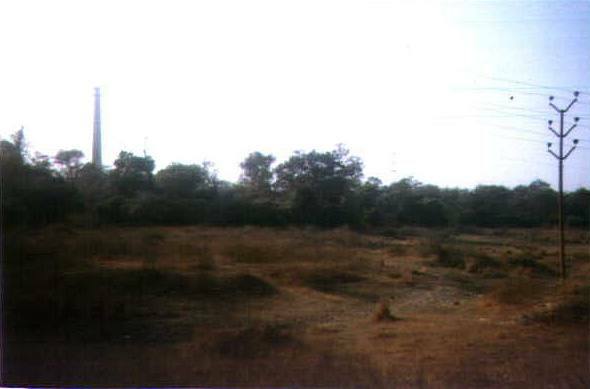 Construction of the Cantonment started in 1806. The British presence - the Bengal Army - was established much earlier, the RVC ( Remount Veterniary Corp. ) celebrated it's 200th anniversary in the 1980's. The Cavalry led any charge in the 19th century in Western armies, however the latest recorded use of the Cavalry dates to somewhere during the end of the 2nd World War(1940-44). In India Cavalary and RVC still has a place of honour in the order of things. It all started with Robert Clive. Prepared to read a long ( 46 pages ) discourse about him? Then Click here. Interested in the British Raj ? Then Click here before proceeding further. . . . Or here ! ( same thing ) ....or here. 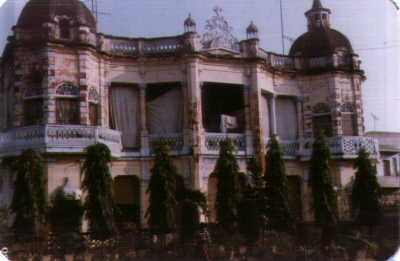 The present Alahabad Bank building. 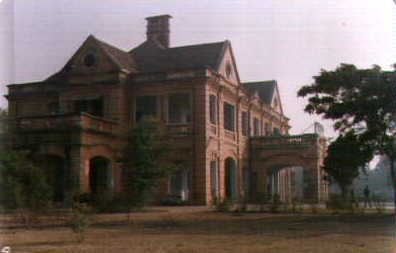 Housed the Duke of Connaught in the last decade of the 19th century. 1884?-1886?. Addr: 55 The Mall. His full title which was very important in those days was The Duke of Connaught and Earl of Strathearn . The longer the title the larger the house. He was the 3rd son of Queen Victoria. Another label was Prince Arthur. To see a picture of him arriving at Meerut Cantonment Railway station click here. There are a lot of British Army officers in that picture. The picture is black and white so you have to imagine them in Red coats and white hats with silly plumes. To return to this page use the Browser back button . Click here to view Neil's site which includes a lot of information on Prince Arthur. And click here to read how Winston Churchill met/saw Baden-Powell at a Meerut Polo championship. Written by Churchill himself. Another famous name was stationed here in the early 1900s. A Baden-Powell, who is credited with establishing the Boyscouts movement. He established the Dairy farm* , a Bakery and a Soda Water factory here. Click here to read more. And yes Winston Churchill came here ( from Bangalore ) to play a polo match sometime in the 1920's. Search Google for Meerut and Churchill you will get the document. The journey details themselves would be interesting. Until the 1970's it was not easy to reach Bangalore, even from Bombay. An entire team must have come with Horses!! But the British built the Railways mainly for army use, and that still holds. Another important world war II figure, who was stationed here was General ( don't know which flavour) Auchinlech in 1938. It is said that the East is East and the West is West and never the twain shall meet. Well they co-existed here for years. 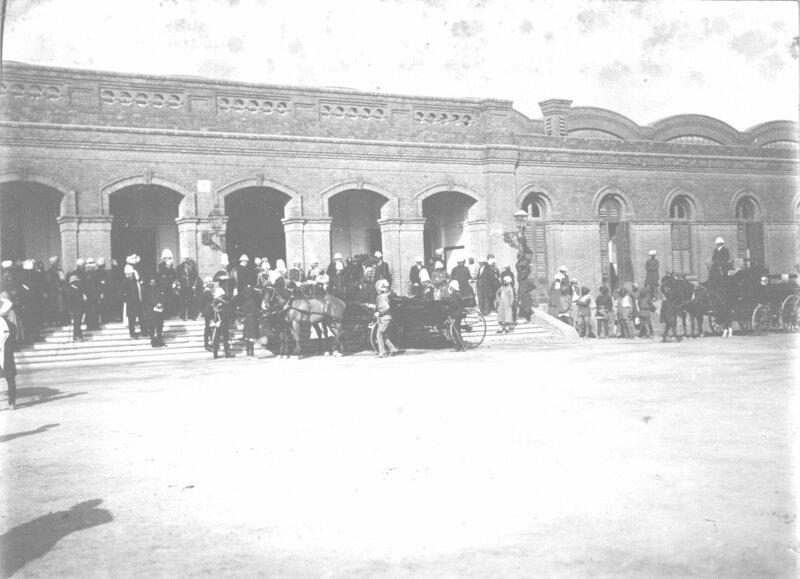 And Twain himself came to India ( not Meerut ) around 1897. Click here to read his fascinating account. At that time Calcutta was the Capital of India. He was writing for a newspaper it seems. On second thoughts don't click here because then you will never come back to this page. For tours & information on colonial India contact Rajesh Rampal 57 , Vaishali, Pitampura, Delhi - 110085. Phone: 01127318023, 9871124913. email: rampalrajesh@hotmail.com. 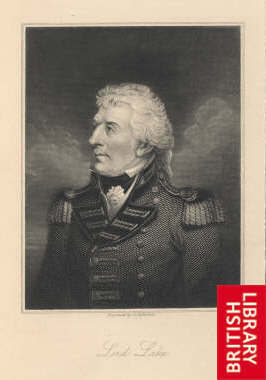 He is the author of a book called The Divine Stranglers about thugee, and is an expert on events relating to the Mutiny of 1857. Note: But WHY are cantonments all over the country full of places like these. This by the way was a prominent spot of yesteryears. It is still called "purana sub-area". 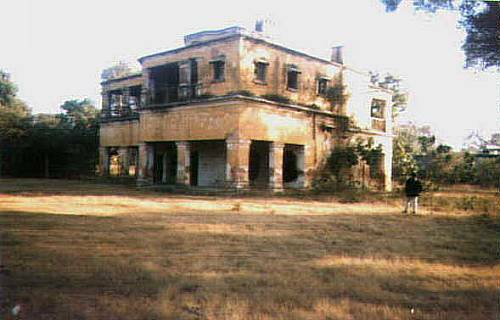 This was the sleepy headquarters of the offices which "control" the cantonment. A pillar naming the original owner ( a Jawahar Lal) existed even in 2003. The ruins are a result of confusion in the current administration about what is a Cantonment and what is a Garrison ( Cantonments usually contained Garrisons for the protection of people of European Descent living in Cantonments). These 2 words are used interchangeably by the post British administration. Hence "Defence of India" rules appear to be "Conquest of India" rules in Independent India. Properties once rented never go back to the original owner - in keeping with East India Company propensities. (What is a Cantonment? How did they appear in India? Click here for a very well investigated write-up). The Oxford Concise English Dictionary says Cantonment is derived from the word Canton. So what is a Canton? The following is from the book Pillar to Post by Laurin Zillacus. "The postal story in Switzerland has some points of special interest. The great mountain ranges in this country divided people into little communities, which largely ran themselves and were called Cantons. It was an easy country to defend against invaders. In theory the Swiss were subjects of the Holy Roman Emperor, but in practice they took as kindly to interference as a hive of wild bees and in much the same manner. There were some bloody battles as far back as the fourteenth century with His Majesty's fief-holding dukes and their representatives which the oppressors found it wiser not to repeat. "(Page 73) For the curious here is some food for thought there are no Cantonments in the mother country ( whose laws dating to 1836! and before are still in force ) only Garrisons. Colonies have Cantonments yes even the US. The Hindi word for Cantonment is Chawani (Ch?ni) is more superficial, it means a place of dark shadows. Are there cantonments today without a Military presence? Sure checkout Landour Cantonment in Mussoorie. There are many such quaint houses . The grand appearance hides the sad state ,which is not very obvious in a photo . Located on the West End road. Meet Qazi Wahaj Ahmed . Why? Because after over 50 years on the job of book binding his eyes still light up on seeing a favourite book. He has in his hands a "Wren and Martin English Composition and Grammar". He says he has been binding these ever since the famous schools Sophia and St. Mary's came to town in the early 50s. 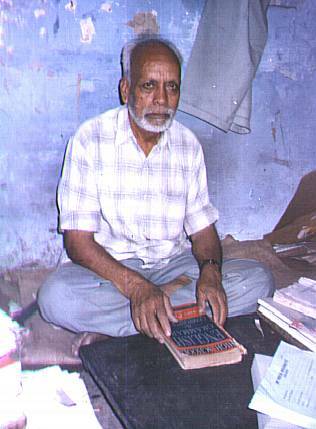 He is specially thrilled when people bring religous books Gitas, Qurans, and Bibles belonging to their great grand fathers or earlier. He and his family used to live in the same place until about 10 years ago - his work place is in the same building as Citi Bakers at Bombay Bazar Meerut Cantt(INDIA). He always has a glow around him at work. This vanishes when you point a rude instrument like a camera at him. Thinking of making your own Website - and you should about whatever interests you . You could follow this format - pictures and text . This can be managed in a piecemeal manner whenever you have time. If you like the format of these pages then just select 'File -> Save As' from the menu then read the pages. In an Html Editor like Frontpage Express or even a simple Text Editor like Notepad. These were made using Acehtmlpro4.0. And yes you can't find a better host than Tripod: 20 Mbs, Free, and when you know how to handle it, even CGI access, yes free. It is never down, and hopefully it is always going to be there. Rubbish !! They did start the fire .